Christmas has caught me a bit off guard this year. I'm usually well into the house decorating and cooking baking by early December. But somehow, it is already mid-December and I have yet to do a single holiday-related task. That is, if you don't count hanging our Christmas wreath on the front door. I had to at least pretend to the world outside that I'd made some effort to make things special for Christmas this year. This couldn't possibly be any further from the truth. Things have been more than a bit nutty in our household lately. This isn't the first time I've mentioned this. Juggling a million and one weekly appointments for my kids, constantly preparing foods for our relatively new "intolerance diet" and my fairly recent return to work have left me feeling drained on more days than I would like to admit. Add to this that the kids keep getting sick, which then gets me sick... and you get one very messy household and one pretty tired momma. The idea of having to set up a tree, drag out decorations and having to test run gluten-, soy- and dairy-free cookies seemed more like a chore to me this year than the fun it usually is. And with the propsect that said tree might remain in my living room until June 2013, I decided to go where no woman has gone before. I decided to not take out anything for Christmas this year. Does that make me the Grinch? Well, I'm just as happy about Christmas this year as I am any other year... decorations or no decorations. I wish I had the time and energy to get things all done up the way I would most years. But there will be many more years of that to come, when my kids will actually be old enough to appreciate all of the whoop-dee-da. I've decided that, at this point in my life, they would probably prefer a rested, sane mommy to a burnt out mommy who yells at them non-stop to stop touching the decorations on the tree because she's so fried she can barely remember her own name. This year, I chose self-preservation over making a big deal just to say that you made a big deal. And God, it feels GREEEEEEEEAAAAAAAAAAAAT! 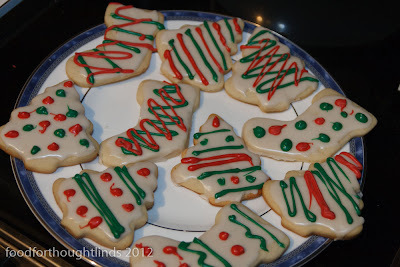 So, staying with the theme of my "no Christmas Christmas", I am posting some cookies that I made last year (how's that for cheating???). I made these last Christmas, but didn't actually get around to posting them before Christmas was over. So they shifted indefinitely into my ever growing "to post" file, never to be looked at again until today. Now, because these are from last Christmas, they are neither gluten, soy, nor dairy-free. And hence, likely much more delicious than if they were something I had made this year. See... aren't y'all benefiting from my procrastination right now?? These sugar cookies are fantastic. 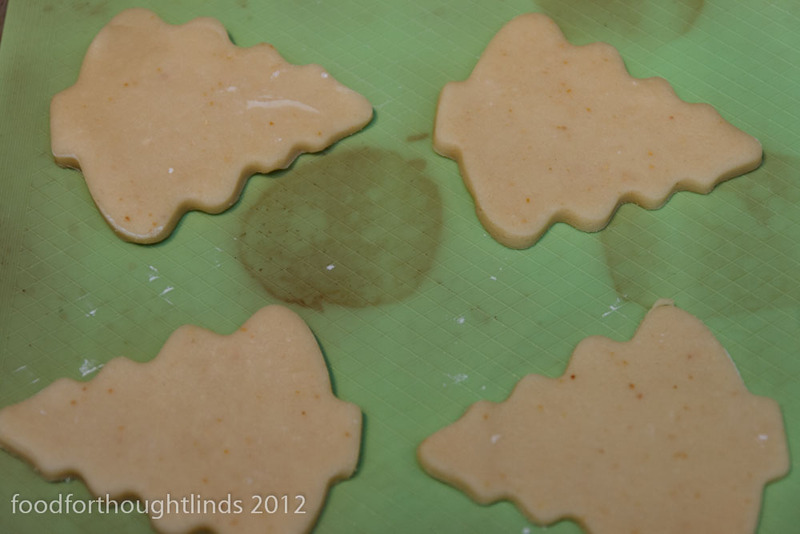 I am typically not a huge fan of sugar cookies, as I don't have the patience to cut them all out and all that jazz. But these are well worth the effort. If you are pressed for time - and let's face it, who isn't pressed for time in December?? - you can make these in advance and freeze them and then decorate them before serving (leaving time for the icing to harden). This recipe was recommended to me by my best friend Heidi, and comes from theKitchn. The best part about it is that the large batch will make about a bizillion cookies, so you will never run out, no matter how many guests you have knocking on your door over the holidays. 1. In the bowl of a stand mixer, cream the butter and add the sugar. Cream until light and fluffy. Add the egg, and beat until golden. Add the cream cheese and again beat until well incorporated. Add the flavourings and lemon zest. 2. Mix the flour, baking powder, and salt in a separate bowl then add, bit by bit, to the butter/sugar mixture until fully incorporated. 3. Refrigerate the dough for at least one hour. 4. Heat the oven to 350 degrees Farenheit. 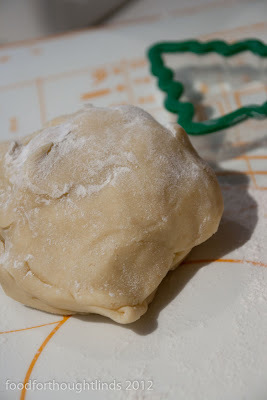 Divide the dough into smaller balls and roll out 1/4 to 1/8 inch thickness. Cut out cookies. 5. Bake cookies for 8 to 12 minutes, depending on thickness. 6. Let cool before icing or decorating, and store in a tightly covered container. 1. In the bowl of a stand mixer, cream the butter and add the sugar. Cream until light and fluffy. Add the eggs, one at a time, and beat until golden. Add the cream cheese and again beat until well incorporated. Add the flavourings and lemon zest. 3. Refrigerate the dough for at least one hour - preferably overnight. I used a recipe for powdered sugar icing from from the Better Homes and Gardens 2011 Christmas Cookies magazine, but only made half the recipe. In a large bowl, stir together 8 C of powdered sugar, 1/4 C milk and 2 tsp. vanilla. Stir in additional milk, 1 tsp. 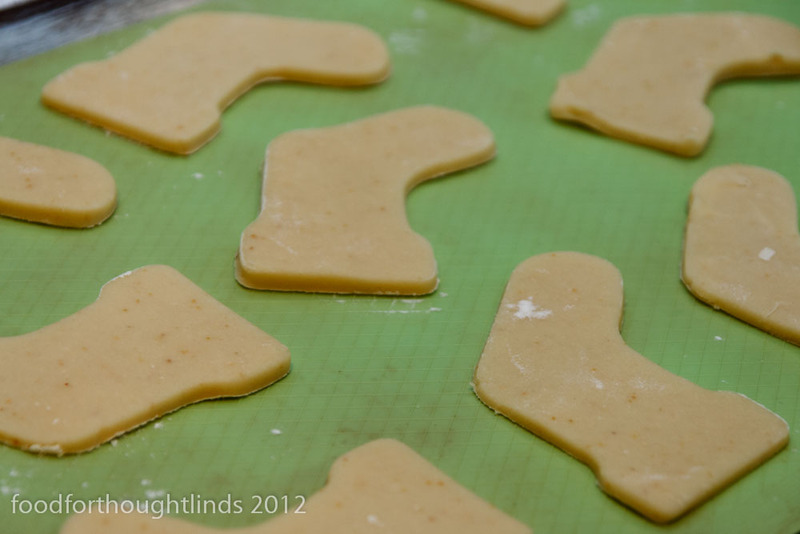 at a time, to make an icing of piping consistency. Tip: Candy coating disks are the little circles of coloured chocolate that can be found in the cake-decorating departments of hobby and crafts stores (I bought them at Bulk Barn). In separate microwave-safe bowls, microwave red and green candy coating disks on 100% power (high) for 1 1/2 minutes or until disks melt, stirring every 30 seconds. Spoon melted coating into separate heavy resealable plastic bags; snip a small hole in one corner of each bag. 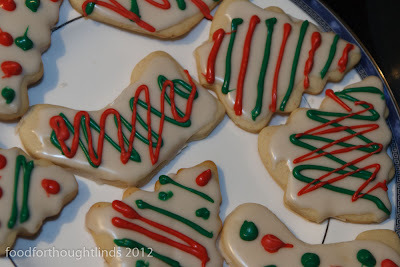 Pipe plaids, zigzags, dots, or other desired designs onto cookies. Let cookies stand at least 30 minutes for coating to set. If desired, add small decorative candies for accents. I need to try this recipe. Every time, and I mean, every. time. I make sugar cookies for my son to decorate they are too crumbly. 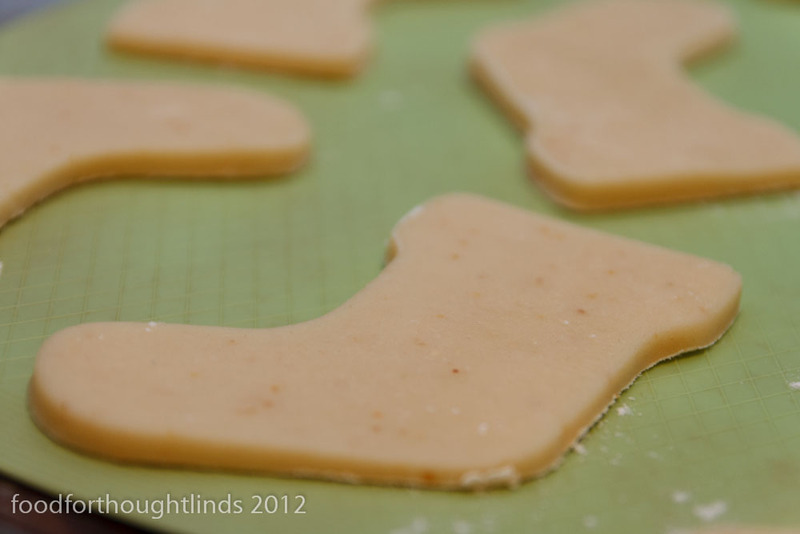 As soon as the rolling pin pressure is applied they crumble like flour. I seriously am the worst baker. 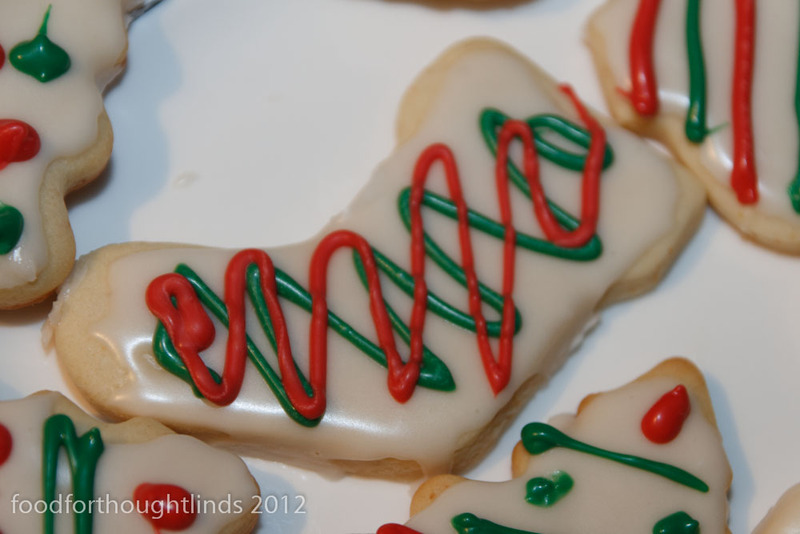 These would be perfect for countdown cookies next year.